Origo – A 3D Printer Designed For Ten Year Olds… Also, Me | OhGizmo! As a kid I loved construction toys like LEGO, K’nex, Ramagon, Construx, Lincoln Logs, Zaks and even Pipeworks. With a little imagination they could become whatever I wanted them to be. But once again, today’s kids have it way easier. 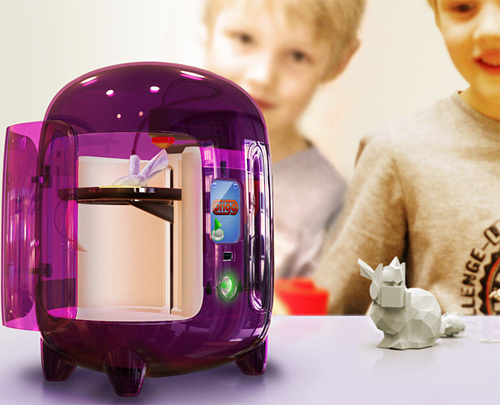 The Origo is billed as a 3D printer designed for ten years old. So it can literally create whatever they can imagine, out of plastic. The finished product might not look as polished as something they bought at the toy store, but it would have the unique advantage of being something they created. Like a 3D low-poly bunny wearing Optimus Prime’s helmet, as seen in the product shot above. And I’m particularly keen on the fact that models can be designed in 3DTin, an easy to use 3D modeling app that runs in your browser. Of course it still can’t compete with toys like LEGO for the simple fact that they’re real, and this is still just a concept that Joris Peels and Artur Tchoukanov really hope to make a reality some day. They’ve documented their progress on the Origo website, and while the most recent prototype certainly looks like something designed for kids, they’ve got a long way to go. There’s no doubt that one day kid-friendly 3D printers will be as ubiquitous and easy to use as say, Easy Bake Ovens. But will the Origo be the first? I was wondering how a child would create a 3D model?! And then found 3DTin! What an excellent app!